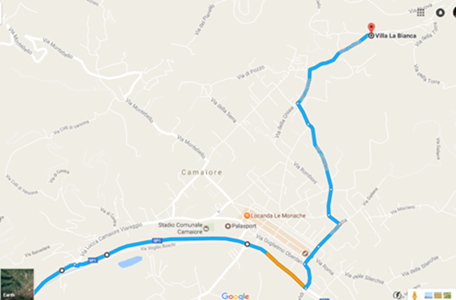 If you arrive following the GPS directions, we suggest you NOT to take the shortest itinerary, but to choose the itinerary below once you are in Camaiore as it is smoother. When approaching a big roundabout with a fountain in the middle and a coat of arm of the town of Camaiore, take the 1st exit following signs to Montemagno, Nocchi. At the 3rd traffic light turn left onto Via Fondi. The GPS will have calculated your new itinerary by then.